AE #112 has a 9-page article (PDF preview; see p13) on “‘Something … ?’: A Study of Comics Pioneer Richard E. Hughes” by Michael Vance. Briefly, Hughes (real name: Leo Rosenbaum) was involved with comic-book publishing from the mid-1930s to 1967, mostly as the publisher-editor-author of the American Comics Group. 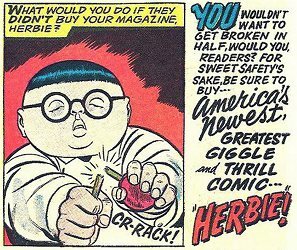 One of ACG’s most popular and unusual costumed -(sometimes) hero titles was Herbie. Herbie was a very anthropomorphic title, too! All the animals in the world could talk with Herbie, and were on a first-name basis with him. Herbie was known as the Fat Fury and the Plump Lump, and was often taunted by his enemies as the “fat, fat water rat, and red all over”. Said enemies included evil hypnotist The Black Whack, freelance Secret Agent X-413½, the Loch Ness Monster, supervillain Mr. Horrible, pirate Captain Skullbones, Fidel Castro, mad scientist Roderick Bump, the two-headed Red Chinese spy Foo-Manchoo (sure, nobody will notice a two-headed man), pizza-loving Dracula, and others of their ilk. The article reveals that, although Herbie ceased publication with #23, three finished scripts had been prepared for #24. 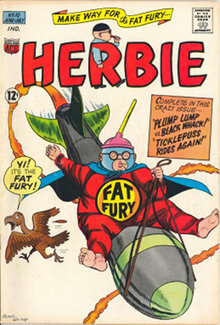 One of these was “The Fat Fury in Bughouse Blues” (12 pages), in which Herbie’s reputation is threatened by an evil imposter, a big, fat woolly-bear caterpillar wearing an imitation of the Fat Fury’s superhero costume as “the Fat Furry”. Yes, only in Herbie could it be assumed that the public would be unable to tell the difference between a human and a tiny caterpillar dressed like him. 1 For information about the Church of Herbangelism and purchasing a copy of its Holy Babble, contact the Church’s pulpit-pounding Pope, Elst Weinstein, 7143 Breno Place, Alta Loma, Calif. 91701; elstwein@charter.net. Expect a LONG delay; these days Dr. Weinstein’s pediatrics practice takes priority over his freewheeling fannish pseudo-religion.